I took both black-and-white roll-film and colour-slide photographs. For technical reasons I did not label each colour slide but made a separate list of the locations and subjects. Following a recent spillage, the 135 slides are now out of order and my memory of which caption on the list goes with which photograph is incomplete. Perhaps a reader of this page can help me match slides and captions and meanwhile enjoy the look back to a time maybe before you were born and when Poland was still working to rule enigmatically and sullenly “behind the Iron Curtain”. I met only one American and one Briton in six weeks. Alas, I was too shy to photograph people outright, so these pictures are perhaps rather aridly architectural, some being of historic monuments which will have changed little. Nevertheless, many may show scenes more “real” than today’s tidied up version. The definition is not as good as on the original slides , but if anyone is interested I can probably get particular images scanned with greater precision. 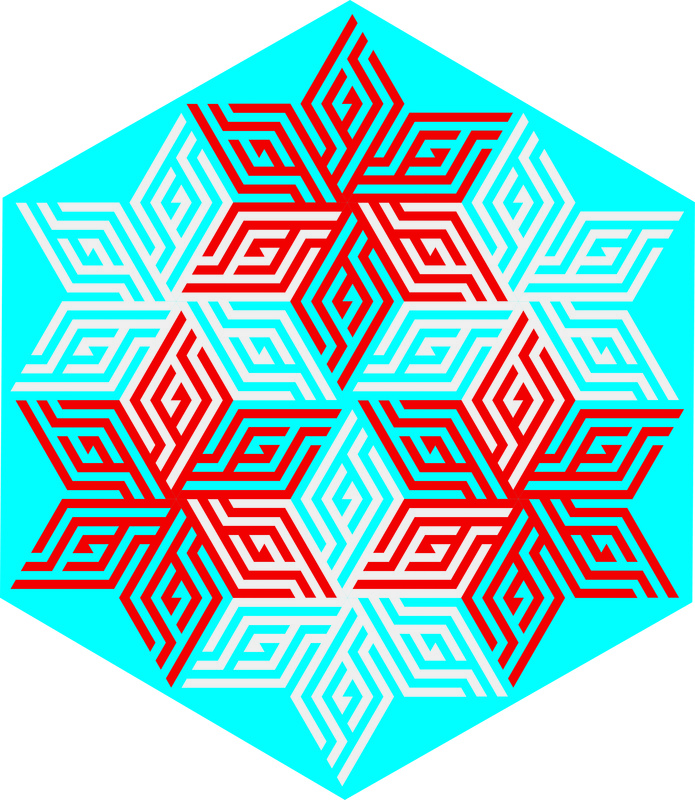 But first, to pay tribute with a tessellation or two, here are lattice labyrinths based on Narodowe Święto Niepodległości, Polish National Independence Day, the 11th of November. As I need two or three colours to distinguish supertiles and the Polish flag is a deep red and white only, I’ve struggled a bit, but the sky-blue background to each helps. 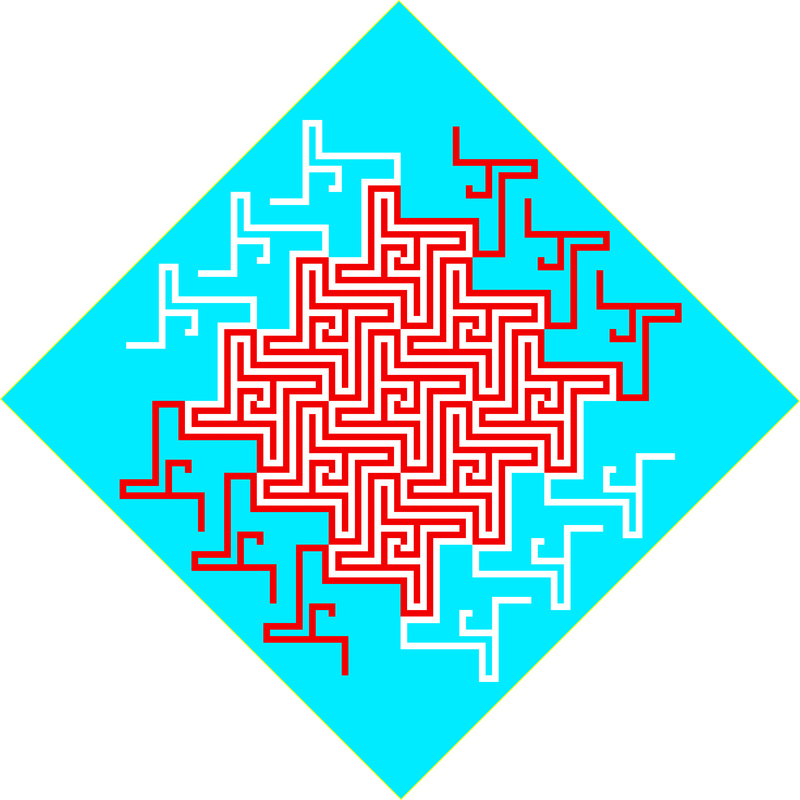 First of all, here are a few supertiles of Serpentine lattice Labyrinth (11,11) There are two families of supertiles, each of identical shape, but a right-angles to one another. Each supertile is made up of 11² = 121 tiles and you need a repeat unit/fundamental domain of one in each orientation and totalling 242 squares to speciofy the infinitely extendable tessellation or tiling of the infinite Euclidean plane – die unbeschränkte Ebene. Switching to equilateral triangular tiles to make up a tessellation, we can construct Honeycomb Lattice Labyrinth (11,11) with a supertile area and repeat unit/fundamental domain of 2(11² + 11×11 + 11²) = 726 triangles. Here it is. Like the (10,10) for Taiwan, it compells the eye/brain to see a three-dimensional construct. Now here are the images of Poland in 1965 that I would like help in identifying. I’ve captioned a few of those I can place. You can contact me via latticelabyrinths.net . 21.Rynek w Kielcach (Kielce Marketplace. The fountain has gone. 52. Youth Club in the PTTK, Lublin where one boy spat on a wall map of Russia for me. 82. St. Barbara, Karczówka monastery.T he statue is from a single mass of lead. 94. In the ambulatory at Oliwa? 111. Tum Collegiate Church, Romanesque Tympanum and doorway arch. Some of the above are famous and even I still know where they are – others (the views across the plain, for instance) almost impossible to locate precisely. I’ll straighten up the leaning towers when I get time. An inexpensive how-to-do-it Lattice Labyrinths workbook is available from the publisher or you-know-who , or from a good independent bookshop or via Google.